Although I lived in Florida for a couple of years in the late 1990s, I’d never had both time and money…at the same time…to travel to South Florida. Thus in early March when I did have that magic combination, I traveled to both Key West and the Everglades. Earlier blogs discussed my two ventures into Everglades National Park, but my key interest in the entire trip to South Florida was touring the Hemingway Home and Museum in Key West. I taught American literature in high school for many years. No course on 20th Century lit is complete without some of Ernest Hemingway’s novels: The Sun Also Rises, Old Man and the Sea, A Farewell to Arms, or For Whom the Bell Tolls. My tour guide was quite knowledgeable, making the tour more pleasurable. I could smile occasionally as he told some little tidbit I knew from the years of lecturing about Hemingway and leading discussions with my students about his novels. The guide offered many bits of information that were new to me and made me resolve to read another of his biographies. The unique polydactyl (six-toed cats) wander the property freely, seemingly oblivious to the tourists. Pampered pets indeed! Cats normally have five front toes and four back toes. 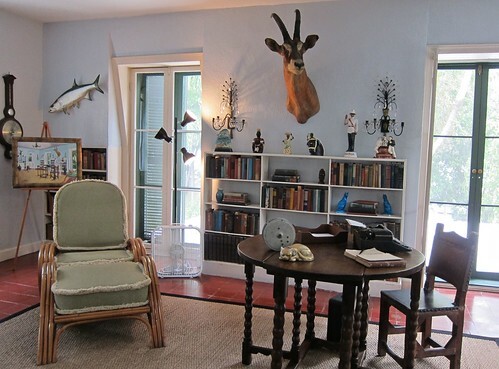 To view a slideshow of other Hemingway Home and Museum, click on any photo. The Ernest Hemingway Home and Museum is home to approximately 40-50 polydactyl (six-toed) cats. All the cats were quite willing to be petted.